Click the "View" menu label at the top of the main window. This toggles the visibility of the Main Toolbar. When unchecked, the Main Toolbar will be hidden. This toggles the visibility of the Appearance Toolbar. When unchecked, the Appearance Toolbar will be hidden. If there are other custom toolbars defined, those will be listed below the Appearance Toolbar menu option. This toggles the display of the Navigation Pane, which enables easy navigation between dates. It also expands into a submenu, enabling the size of the font used by the Navigation Pane to be adjusted. This toggles the display of the Calendar Items List, which contains tabs for listing the calendars, categories, priority types, and locations. This toggles the display of the Details Pane, which shows details about the currently selected event, task, or note. These commands toggle the display of a Clock pane in the lower-left corner of the main window. The clock can be either analog or digital. If one of the Clock options is checked, the clock will be visible. This toggles the display of the status bar at the bottom of the main window. These commands toggle the display of the Desktop Calendar, an interactive, semi-transparent calendar that integrates into your Windows desktop background. The desktop calendar can be in either "full" or "mini" modes. 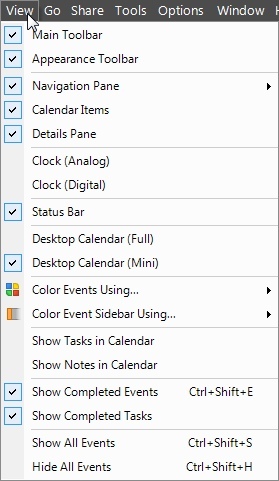 If both Desktop Calendar options are unchecked, the desktop calendar will be hidden. Events can be colored based on the current tab in the Calendar Items area, associated calendar, category, priority, or event location. This menu option enables selection of how events should be colored in the Calendar View, Event List, Popup Reminder Window, Desktop Alert, and elsewhere. This also controls how tasks are colored, but only if the Category Colors or Priority Colors options are checked, since the other options are not applicable to tasks. This also controls how notes are colored, but only if the Category Colors option is checked, since the other options are not applicable to notes. These options enable you to easily scan for things like high priority events, or events occurring at a certain location, based on the associated colors. For more details about using these menu options, click here. The color sidebar can be used to see associated calendar, category, priority, or location colors. For example, if items are colored based on calendar, the sidebar can be configured to show priority colors. All high priority items will have a red sidebar (by default), or whatever color is assigned to high priority items. VueMinder will remember which combination of primary and sidebar color modes you prefer, so when switching the primary color mode, the sidebar mode will automatically update. This will toggle whether tasks are displayed in every tab of the Calendar View. When unchecked, tasks will only be visible in the Task List. This will toggle whether notes are displayed in every tab of the Calendar View. When unchecked, notes will only be visible in the Note List. This will toggle whether completed events are displayed in the Calendar View and Event List. When displayed, completed events will displayed as faded (semi-transparent). The keyboard shortcut is Ctrl+Shift+E. This will toggle whether completed tasks are displayed in the Calendar View and Task List. When displayed, completed tasks will be gray and crossed, unless the color option is set to display based on category or priority. This will enable the display of all events belonging to all calendars, clearing any filters defined in the Calendar Items List. The keyboard shortcut is Ctrl+Shift+S. This will disable the display of all events belonging to all calendars. After selecting this option, each calendar in the Calendar List will be unchecked. The keyboard shortcut is Ctrl+Shift+H.